Mathematics teachers can teach you about x to the power of x and how to find its derivative. They tend to be unaware of the power void in the organogram in mathematics education, relating to their own responsibility on how they teach you. Hm. Say again ? Teachers decide How they do this. 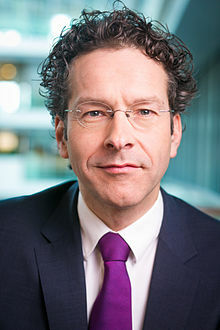 This principle was established by the Dijsselbloem commission in 2008. Jeroen made his career by observing that too much had gone wrong in the past by former Parliaments not respecting the responsibilities of mere teachers. See my earlier report in 2013 on Dijsselbloem on money and math. This division of labour between Parliament and teachers sounds fine, also when Parliament decides that pupils and students should be educated on mathematics, except … when math teachers don’t teach mathematics but teach so-called “mathematics”. To avoid over-quotation, I will write math teachers instead of “math” teachers. When teachers are defunct then Parliament needs to be able to observe that it doesn’t get what it wants. But can it do so, when it wants to remain at some distance ? Will it wait till Hell freezes over ? What happens when there is a power void in the world of How, with no way to settle issues except a dirty math war ? Mathematician Hans Freudenthal and his minions (I did enjoy watching this movie “Minions” with my youngest son (a requirement)) have been pushing “realistic mathematics education” (RME). This has been wreaking havoc in education – and in Dutch society as a whole, in so far as it depends upon competence in math (but it may also be taken over by China). Mathematician Jan van de Craats has been pushing for traditional math education. But Van de Craats has no training as a math teacher and is creating his own conundrums in mathematics education. Also, RME has been exported to the USA, and now the OECD is transporting it back to Holland under the guise of “21st Century Skills”. Van de Craats may not have expected this boomerang, and may now be poised to export his own delusions to the world. To resolve the power void on the How, my suggestion from 2008 is to have a Simon Stevin Institute (SSI), that can implement a proper mathematics curriculum and train and advise teachers on didactics. A major role in SSI is for teachers with a training on empirical methods. The distinction between mathematics and so-called “mathematics” can be indicated by these two tables. Freudenthal was a mathematician who assumed the role of math educator for which he hadn’t been trained. He stole ideas from teacher Pierre van Hiele. See here. RME textbooks tend to avoid mixed fractions, discovered Liesbeth van der Plas. If tests give you a B instead of an A then this still is above average, so don’t complain that you haven’t been taught everything. Jan van de Craats is a mathematician who opposes the chaos that RME is wreaking. He has no training on education either, and is creating his own chaos. He doesn’t defend Van Hiele against Freudenthal’s fraud, likely because he doesn’t understand what that didactic issue is about. See the breach of integrity of science and the weblog entries on van Hiele and on fractions. Classical math is 2 + ½ while it is confusing to write 2½ (two-times-a-half as in 2√2). Pierre van Hiele suggested that fractions could be abolished, and instead he suggested using the power notation which students have to learn anyway. My own suggestion is to use H = -1 so that the use of -1 can be avoided. Pupils who are still learning arithmetic and who see -1 might think that they must subtract something. Instead they learn the rule that x x^H = 1 provided that x ≠ 0. Later when powers and roots are introduced then they can see the value for H (eta). See the Appendix below for the abolition of fractions by means of H. This supplements our earlier discussion. A key role in the debate about RME is for long division. Charles Fadel, who has no degree in math education but a bachelor in electronics and an MBA in international marketing, advises the OECD on “21st Century Skills”, and wonders, see his weblog, whether kids must learn long division. My response as a teacher is that if you want kids to learn arithmetic then they must also master long division. I hope that Fadel supports the notion of a Simon Stevin Institute, which provides the environment to properly discuss his ideas, and that he stops using his elbows in an environment with a power void. Stop taking advantage of an old lady who cannot defend herself. Traditional mathematicians insist that kids learn safe and sure algorithms, and that practice makes perfect. RME suggests that kids need to understand what they do, and that it doesn’t matter how they reach the answer as long as it is good. RME forgets that proper arithmetic algorithms also prepare for later algebra, so that it really matters how you arrive at an answer. Apparently long division got abolished as “mechanical”, and replaced by a different method, called “partial quotients“. This method is also mechanical but deviously not called so since it allows more room for time-consuming random-guessing. 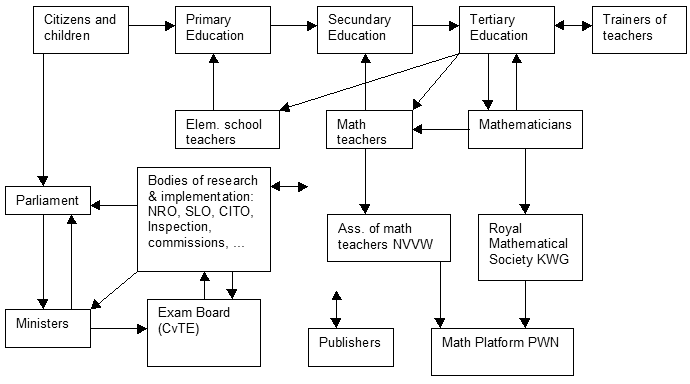 The key contribution of this weblog entry is this organogram of mathematics education in Holland. It shows a proper power structure for Parliament and its What. It also shows the void for the How. It is a jungle out there, with all kinds of commissions, and two clear wrongs: (a) mathematicians are meddling, because they regard math ed as their subject, which it isn’t (see also Norma Presmeg’s diagram here), (b) Parliament (deviously or desperately ?) tries to gain control over the How anyway, e.g. by the Inspection. In my analysis, the SSI must control the Inspection, instead of the current inversion. There is a clear distinction between mathematicians and teachers of mathematics. There is power base for What but a power void for How. Mathematicians create noise on both What (2½) and How (RME, traditional). Parliament is isolated from How by a layer of bureaucracy, but this requires quality public management, which is rather risky and not quite realistic. Minister and Parliament have a tricky influence on How by means of the Inspection. In the past the Inspection imposed RME while teachers protested ! This is a wrong allocation of power. The Inspection must be under control of teachers. The Simon Stevin Institute would redress this jungle and make for proper governance with shorter connections. The council of SSI would have teachers, parents, entrepreneurs, students, and also some mathematicians. See the book “Elegance with Substance” on your national equivalent. NB. The meaning of the arrows is ambiguous. The meanings rather depend upon the boxes the arrows are between. The arrows from Bodies and Publishers to nowhere replace a network to other boxes. While the diagram focuses on math professionals, there are of course also pedagogues, psychologists, and other. NB 1. For Dutch readers, there is this memo. Observe that Jan van de Craats has not been supporting this 2008 proposal for a Simon Stevin Institute, but running his own sect. NB 2. A key role is for Member of Parliament Paul van Meenen, math teacher, and member of opposition party D66. This party of “Democrats” (as they call themselves) has been founded in 1966 with the objective of having direct elections of prime minister and mayors, with a system of district voting, while also referenda were included in their “crown jewels”. However, these methods are not democratic but rather anti-democratic. The “scientific bureau” of D66 neglects and suppresses this critique. D66-founder Hans van Mierlo was rather a demagogue who was in love with the USA of John F. Kennedy and who disliked the Dutch polder methods. Math teacher Paul van Meenen should be able to show his D66 in mathematical manner that D66 can better abolish itself, since those “crown jewels” are not what D66 says they are. D66 lies to the electorate. See “Voting Theory for Democracy“ and my political pamphlet calling for the abolition of D66 (it may be politics when you want to see respect for science). See also the relation of D66 to LibDem in the UK 2015 General Elections. Consider the crooked so-called “mathematical” division of mixed fractions: 2½ / 3⅓ . Van der Plas (2008) reports that this operation hardly occurs in “realistic mathematics” textbooks. Traditional mathematicians like Van de Craats et al. and Hung-Hsi Wu from the USA want to see a lot of practice on this again. For students the notation however is confusing, for in handwriting it is easy to get 2 ½ / 3 ⅓ = 1 / 3 ⅓ = 1 / 9. The mathematical meaning of the inverse x^H is that: x x^H = 1 (for x ≠ 0). On the calculator we find a numerical approximation of x^H by: (x)^(-1). A relation for exponents is: x = (x^H)^H. This is a new notation. Who is used to it may take longer strides. For now, we take small steps. A classical operation may be at least as long. Properties of H (“eta”) are stated in the book “A child wants nice and no mean numbers“ (2015) with some observations that might be useful for elementary school (I have no degree on that area). Eventually, students must learn to handle exponents. The following might seem complex but eventually it will be faster and more insightful. Obviously, this is only an expectation, and it must be checked with pupils whether this expectation is corroborated. It are the pupils who determine what works. I can only hope that there will be a SSI such that this testing can be done without the mud of the current dirty math war in Holland (supported by Freudenthal Institute in Utrecht and Jan van de Craats at UvA). For comparison: the crooked manner of traditional so-called “mathematics”, in which the notation determines what must be done, and in which you don’t merely denote what you are doing.